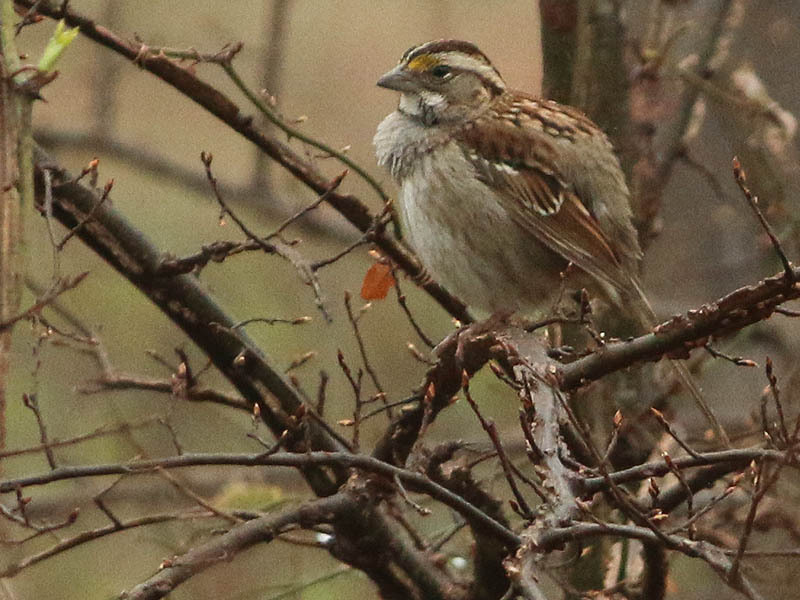 A light rain was falling when I found the pair—a male and a female—of White-throated Sparrows roaming through a small thicket. 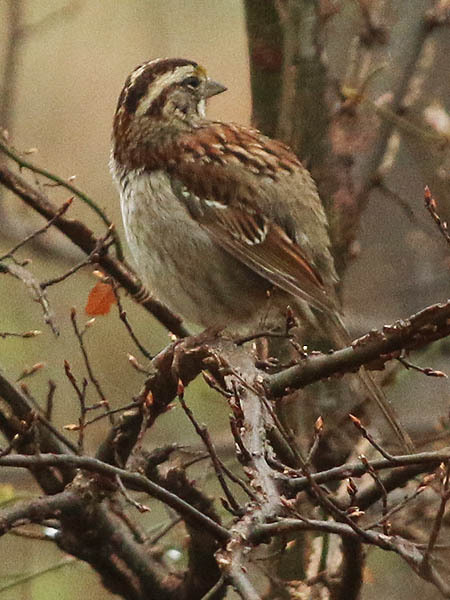 The two birds were following each other through the woods, pausing only occasionally to shake off excess rain water and to preen. 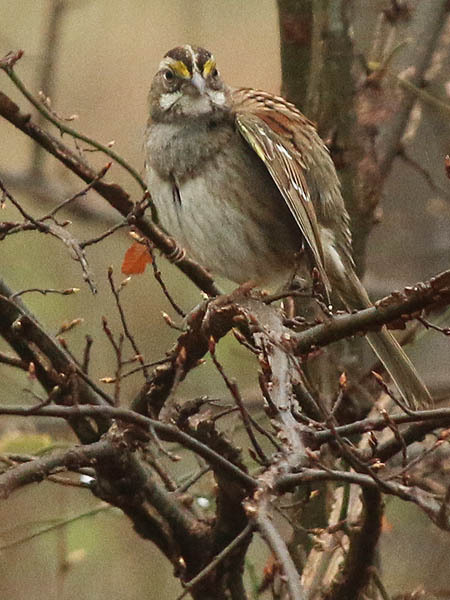 The White-throated Sparrow is a passerine bird of the American sparrow family Emberizidae. 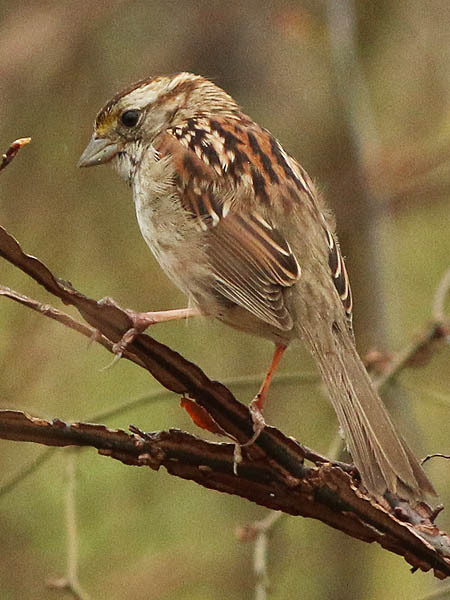 The White-throated Sparrow measures 15 to 19 cm (5.9 to 7.5 in) in length with a wingspan of 23 cm (9.1 in). Typical weight is 22 to 32 g (0.78 to 1.13 oz), with an average of 26 g (0.92 oz). 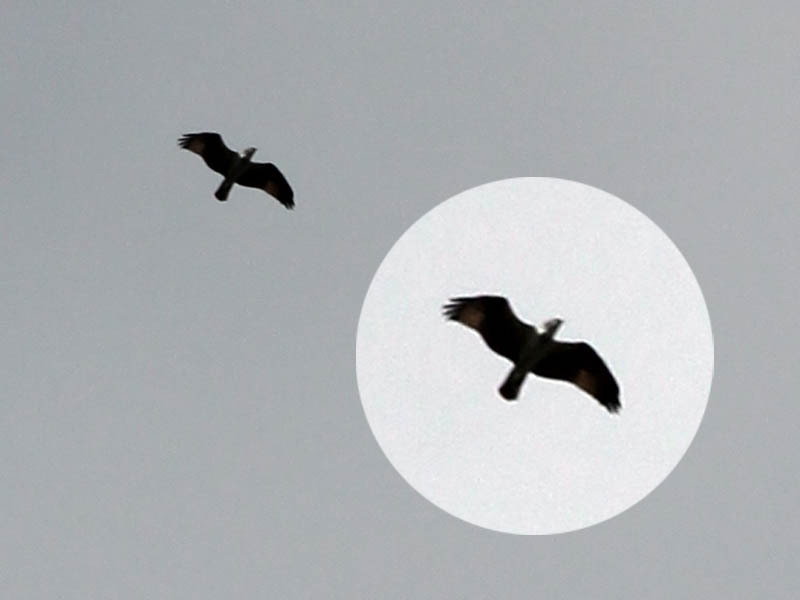 Among standard measurements, the wing chord is 6.3 to 7.9 cm (2.5 to 3.1 in), the tail is 6.8 to 7.7 cm (2.7 to 3.0 in), the bill is 1 to 1.2 cm (0.39 to 0.47 in) and the tarsus is 2.2 to 2.4 cm (0.87 to 0.94 in). On the tan form, the crown is dark brown with a tan central stripe. The supercilium is tan as well. The auriculars are gray/light brown with the upper edge forming a brown eye line. 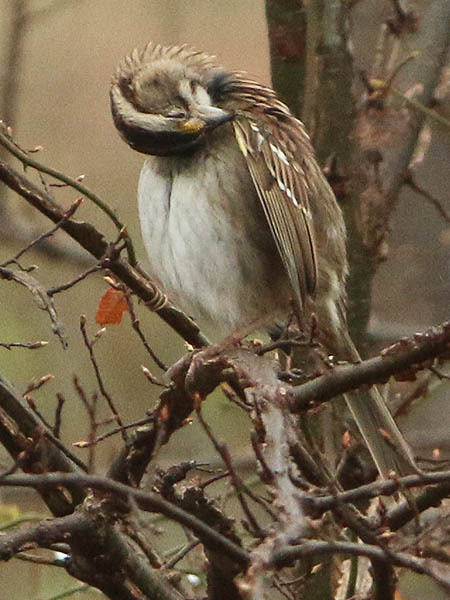 Both variations feature dark eyes, a white throat, yellow lores and gray bill. 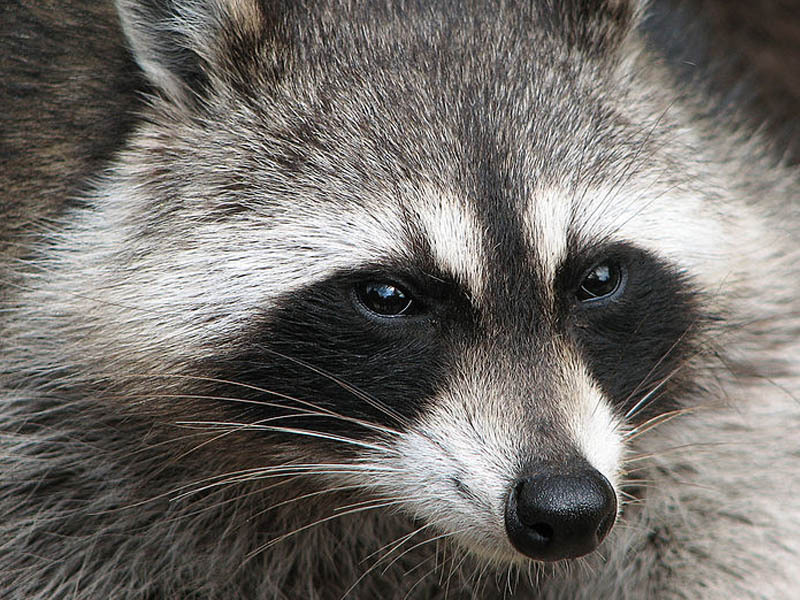 There is variation and some individuals may show dark lateral stripes of each side of the throat. They almost always pair with the opposite color morph for breeding. The two color morphs occur in approximately equal numbers. 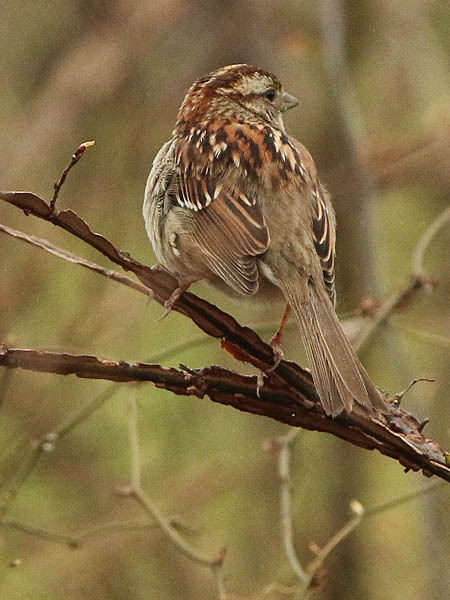 Both male and female white-striped birds are more aggressive than tan-striped birds during the breeding season.